It's time for another chapter of Learn Like a Pirate! 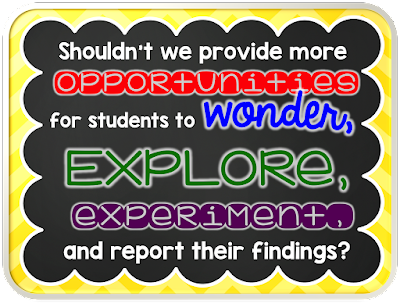 I was late to the game last week, but you can check out my post HERE, where you will also find this great FREEBIE I made to go with the discussion about classroom jobs. Chapter 5 was definitely my favorite, so make sure and check it out! When I'm thinking about what to blog about the reading, I really like to focus on what stood out most to me when I was reading. You know...that thing that when you read it you immediately text someone who will think it's just as amazing as you? So, maybe you don't do it at 1:39am like I do, but my teacher friend Shari is not surprised by this. But before I get to the story behind the text, I want to focus on something significant in this chapter. Solarz spends a great deal of time discussing Science Fairs. I'll be honest when I say that I thought Science Fairs were dead. Or optional. Or at least that's the way it was at my kids' school. If you wanted to you could, but it was to be completed at home on your own time with these vague instructions. And don't even bother asking questions because if you didn't understand the instructions, maybe you just shouldn't do anything at all for the Science Fair. But, hey-I'm not going to put all the blame on the schools. I have 3 kids of my own, and seriously, the last thing I want to do after being at school all day is work on a science project. Ugh. Seriously. Aren't science fairs one of the best ways to do this? Solarz says that students become much more invested in the learning process when they are given time to explore interests of their own. 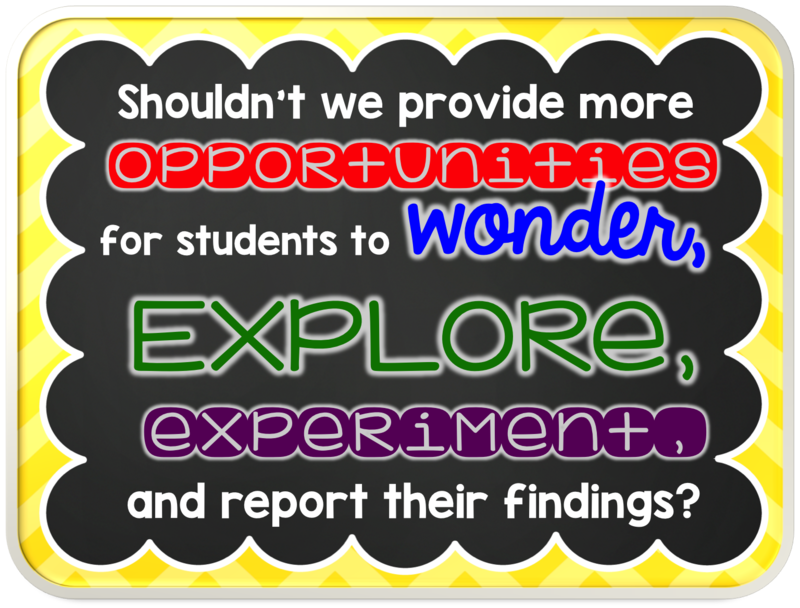 Science fairs allow students to do just this and put the focus on science. The ENTIRE PROJECT must be done in school. That's it. Pretty simple, right? And I'm pretty sure parents would appreciate it. Of course, Solarz helps by supplying most of the needed materials and helps students collect data. Not to mention, additional help is always available from classmates. But this will take time away from instruction!!! Only if you let it. Solarz allows students to work on projects before and after school and at recess. All the "paperwork" is done as a class, and he walks the students through a few steps each day and allows them some time to work. But what if the students aren't working??? Solarz has deadlines to keep all the students on track. But, he also emphasizes that since they are in charge of choosing their projects, they are even more motivated to learn and more engaged. 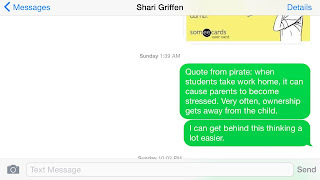 Now, remember that text to Shari? I told her that Solarz said that students lose ownership when they take work home. Think of how many times you have "helped" your own child. I know for a fact that I dominate projects at home. I am so guilty of taking ownership away from my boys. I thought it was better for them and quicker for me. Now I realize I wasn't really doing my kids a favor. In fact, I now realize it was an injustice to them. But talk about some serious mom guilt. Isn't it my JOB to help my kids? Well, instead of dwelling on that, I'm going to focus on the fact that Solarz also says that student skills will be able to mature because parents aren't there. Now-am I saying to be completely hands-off when it comes to homework or home projects? Absolutely not! But-I think it's time we-and especially I-start to understand that allowing kids to lead their own learning and make mistakes is valuable to the learning process. I also want to point out that Solarz is still there to oversee the entire process and give feedback to the students. But-I think the real truth lies in what students are able to do independently without the interference of adults. I can't wait to try it! Well, lots of you are in Vegas, and I hope you're having a blast! I'm sitting here at the Great Wolf Lodge in Kansas City listening to the sounds of kids sleeping after a hard day of playing. PS: Don't forget to check out the blogs below for more insight into this chapter.